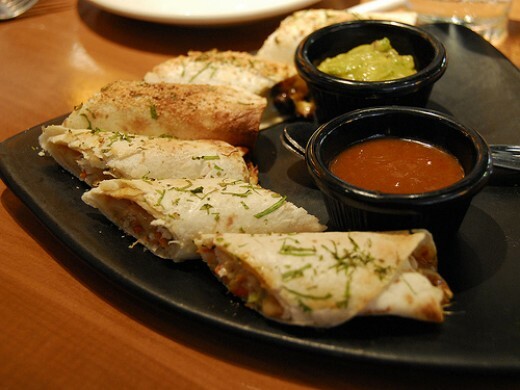 Here is a restaurant copycat recipe for California Pizza Kitchen's Tortilla Spring Rolls. These appetizers come in 3 different flavors. Read on to learn how to make these appetizers at home using flour tortillas and simple ingredients. Thai Chicken: which has chicken, bean sprouts, green onions, carrots, mozzarella cheese in a spicy peanut sauce. Served with Thai peanut sauce. Baja Chicken: which has chicken, roasted corn, black beans, chilies, red onions, jack, cheddar and parmesan cheeses. Served with guacamole. Mediterranean: which has grilled mushrooms, eggplant, tomatoes, onions, fontina, mozzarella and parmesan cheeses. Served with marinara sauce. I start with store bought rotisserie chicken which make these very simple to construct. Just slice off some of the white breast meat, shred and marinate in bottled sauce depending on the type of roll you want to make. For the Thai Chicken buy a bottle of peanut sauce. For the Baja Chicken I like Lowry's Baja marinade. Once you have your chicken marinating. Decide which vegetables you want to use and saute them in a skillet with some olive oil. Next, you build your "Spring Roll" like you would a burrito. Add the chicken, vegetables and cheeses. Fold both ends together to make a flap and then roll into a round tube. Place seam side down on a baking dish. Brush with melted butter and herbs of your choice. Bake in a medium oven 350 for about 8-10 minutes or until golden brown and the cheese had melted. Yum! if you are a Thai food lover,this is perfection as far as combined herbs and sweet/spicy.